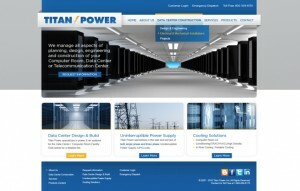 Titan Power, Phoenix, AZ extends its responsiveness with the launch of a new website. Features include overviews of data center construction, product information including sales and service of UPS, power distribution, battery and generator products. Titan Power Inc. in Phoenix, AZ ratchets up its level of service with the launch of their new generation website. Extending its commitment to emergency power customers in Arizona, Nevada, California, New Mexico, Colorado and across the Southwest, the new site allows clients and potential customers to find a wealth of timely information on all aspects of mission-critical power systems. The site has a picture gallery of major emergency power construction projects that highlight Titan Power’s “turn-key” data center construction services. Potential customers can register to receive updates on the company’s sales, installation and service capabilities, including technical support, sales, service and repair for uninterruptable power systems (UPS), power distribution equipment, batteries, data-center cooling systems and generators. One of the major additions is the ability to provide information on improvements in the broad spectrum of mission-critical equipment. For example, a visitor to the new Titan Power website can read about new high-performance cooling systems for datacenters that allow for the addition of more equipment without expanding the footprint of the facility. Website visitors will be able to access basic information on a wide range of products and services 24/7, with the ability to easily request additional information via e-mail or telephone. The new site will archive informative newsletters and press coverage, as well as upcoming educational events directed to the individuals who manage the data and IT centers for their respective organizations. The improved navigation, inclusion of an expanded product section make this new site the “go to” place for data and IT professionals needing background and comparison information for bid specification and RFP preparation. Titan Power customers are particularly pleased with their password-protected section of the new site. With a username and password, they can view all their contracts, renewal dates, proposals/bids, and maintenance schedules. As each scheduled maintenance visit is completed, Titan’s technical staff will update each customer’s record to reflect the completed task then send the customer an electronic Field Service Report (FSR) documenting the completed service. This feature is especially important for managers who oversee data centers in multiple locations, as it provides a real-time record of this important feature of Titan Power service with a few key strokes. Celebrating 25 years in the emergency power sales and service business, Titan Power knows the mission-critical field inside and out. Their breadth of sales and service delivery across the southwest allows them to provide significant emergency power consultation expertise prior to the purchase of upgraded or replacement equipment. Their industry knowledge supports customers as they transition from less efficient back-up systems to “greener” systems that take up less room, consume less electricity, and provide more secure operation. The success of Titan Power is grounded in their “Culture of Responsiveness,” and the launch of a more user-friendly website is yet another way they support the professionals they serve. Titan Power, Inc is a full-service provider of uninterruptable power solutions and preventative maintenance. They are licensed to provide “turn-key” data center, main distribution frame (MDF), and independent distribution frame (IDF) construction in Arizona, California and Nevada, including appropriate cooling and ventilation components. Their experienced professionals provide consultation on design, engineering, specification and compliance for mission-critical installations in hospitals, public safety and military organizations, casinos, and a wide variety of large and small data centers. Titan Power is an approved contractor for the purchasing function of the State of Arizona, and is thereby pre-approved to provide its services to any Arizona municipal entity in the State. Titan Power has experienced UPS/battery service and installation professionals in Arizona, Nevada, California, New Mexico and Colorado. For more information, or to sign up for Titan Power’s technology updates, go to www.titanpower.com, or call 800-509-6170 to speak to an emergency power professional. This entry was posted in Back-up Power Industry, Company Misc., Customers, Data Center Construction, Employee News, Mission Critical Industry, Uncategorized, Uninterruptible Power Supply and tagged Arizona, Data Center Construction, Mission Critical, Organization, Titan Power, Uninterruptible Power Supply, UPS Systems. Bookmark the permalink.